Inmates at Tocuyito prison in the Venezuelan state of Carabobo have taken four other prisoners and dozens of guards hostage in a jail riot. Photos on social media show the four prisoners kneeling with their arms held up while other inmates appear to be threatening them. Three of the four men targeted are listed as "political prisoners" by a Venezuelan NGO. The rioting inmates are demanding to be moved to an open prison. A photo shows them holding signs reading: "We want peaceful dialogue" and "We want an answer". 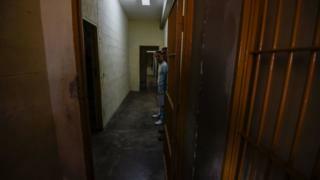 Three of the inmates being held have been named as Alexander Tirado, Juan Poletti and Antonio Garbi, who are listed as political prisoners by Foro Penal, a non-governmental organisation which provides legal help to inmates. Foro Penal says there are a total of 238 political prisoners in the country. The government says there are no political prisoners in Venezuela but that those being held have been arrested over "their participation in acts considered crimes". Alexander Tirado was sentenced to eight years in prison for conspiracy and instigation to civil disobedience after he took part in anti-government protest in 2014. He has been appealing against the sentence arguing he protested peacefully. Juan Poletti and Antonio Garbi are awaiting trial after being arrested over the shooting dead of a police officer during an anti-government protest in March 2014. Ms Manrique said that Jesús Albi was also among those being held hostage. Mr Albi has been charged with the murder of Almelina Carrillo, a woman who died after being hit by a bottle thrown from a building while she was taking part in a pro-government march in April 2017. He denies the charges. In an interview with an online news channel, Alexander Tirado said that the other prisoners had forced the four inmates to act as mediators between the rioters and the prison authorities. "They've threatened us with grenades so that we speak to the [prison] officials and call the media to inform them of the situation. I call on the prison minister and on [President] Nicolás Maduro to help. We've had enough of being used as hostages, our lives are in danger," he said. "I don't want to die in prison."